This chapter describes the hard/software setup of a weather station whose measurements are to be exposed via OGC protocols like WMS, WFS and in particular SOS. In 2008/2009 Geonovum acquired a Davis Vantage Pro II Weather station. This station was/is mounted on the roof of Geonovum building. The outside station-sensors measure barometric pressure, temperature, humidity, rainfall, wind speed and direction. Data is continuously sent (wireless, via RF) to a base station, a.k.a. the “console”. The console has a Davis WeatherLink® hard/software add-on that is able to act as a data-logger and provides connectivity over USB. Data from the weather station was extracted and published to the 52N SOS via a special purpose PC application. The results of this project have been described in a Geo-Info magazine article (2010-1). 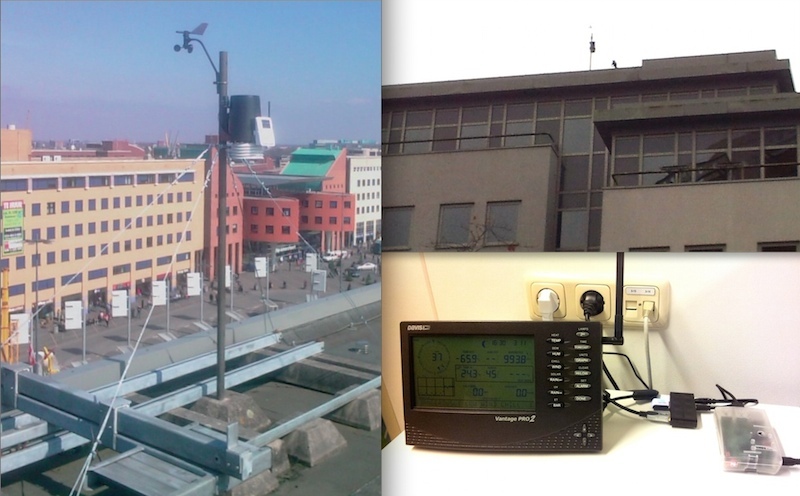 As part of the SOSPilot project, we will now “revive” the Davis Weather station and connect its data stream to the SOSPilot infrastructure simliar to the RIVM AQ datastream. Eventually, the goal is to expose the station weather data to OGC services like WMS, WFS and in particular SOS. As we cannot connect the weather base station (USB), directly to the SOSPilot server “in the cloud”, an intermediate “middleman” hard/software component will be required. The main functions of this component are to acquire data from the base station and to transform and publish this data to the SOSPilot server (VPS). To this end a Raspberry Pi (RPi) microcomputer has been chosen. The RPi is a cheap (around $25,-) credit-card-sized microcomputer that can run free OS-es like Linux (Raspbian, a Debian version) and allows connectivity to USB, WIFI, GSM etc. The RPi is popular with weather amateurs (and various other IoT projects as well). The overall architecture is depicted below. These components and their interconnections operate as follows. The Davis weather station is connected to a Raspberry Pi (RPi) micro computer via USB trough the Davis WeatherLink®. The RPi runs the Raspbian OS with the weather data software weewx. The weewx daemon continuously reads raw weather sample data from the Davis weather station and stores this data locally in a (SQLite or MySQL) database. These measurements, called weewx Archive Records are typically a 5-minute summary of multiple samples (weewx Loop Records ) collected every few seconds. An ETL process based on Stetl transforms and syncs data from the SQLite weather archive database to a remote PostgreSQL server in a “Cloud Server” (the Ubuntu VPS used in the project). Other weewx plugins generate reports with statistics and summaries. These are synced regularly to be viewed as webpages in a browser. 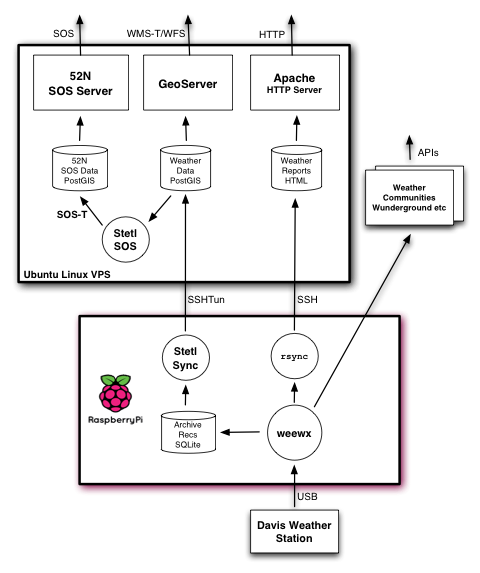 The VPS runs GeoServer to serve the weather data directly from the Postgres/PostGIS database, using specialized PostgreSQL VIEWs, as WMS, WMS-Time and WFS. In addition the VPS runs a Stetl ETL process that transforms and and publishes the weather data from PostgreSQL using the SOS-T protocol to the 52North Sensor Web Application server. The latter provides a SOS (Sensor Observation Service). Via the web browser various WMS/WFS and SOS client applications are invoked. The next sections will expand on this overview. The global architecture is depicted below. In all figures in this section the arrows denote the flow of (weather) data. Circles denote continuous data transformation processes. Rectangles denote application servers or services. The figure below depicts the software architecture at the global level. 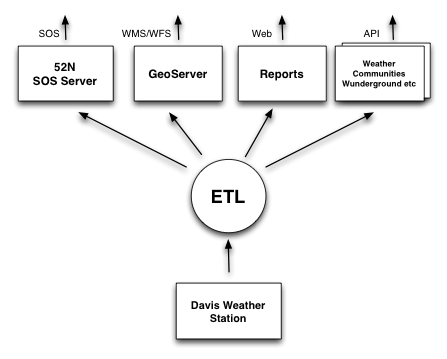 ETL (Extract, Transform, Load) processes extract and transform raw weather data from the Davis weather station and publish the transformed data to a variety of application servers/services. Each of these servers/services will provide standard (web) APIs through which client applications can fetch (weather) data. This global architecture from Figure 2 is expanded into a more detailed design in Figure 3. This shows the various software and storage components, in particular the realization of the ETL-processing. The (data) flow in Figure 3 is as follows. The above components are divided over two server machines. Connections between the RPi and the VPS are via SSH. An SSH tunnel (SSHTun) is maintained to provide a secure connection to the PostgreSQL server on the VPS. This way the PostgreSQL server is never exposed directly via internet. Each of these components are elaborated further below. Sources for this architecture can be found in GitHub. In addition, weewx will be configured to report weather data to the Weather Underground personal weather station network at http://www.wunderground.com. A Raspberry Pi will be setup as a headless (no GUI) server. Via a USB Cable the Pi will be connected to the Davis datalogger cable. 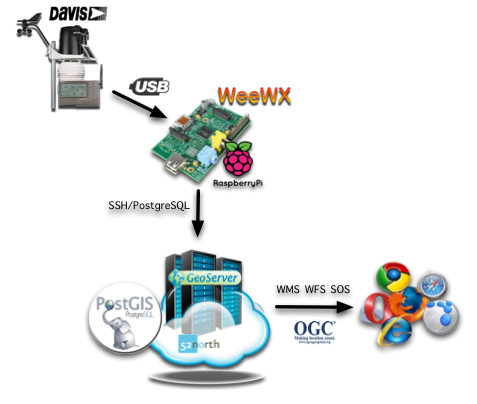 The Pi will run a Debian Linux version (Raspbian) with the free weewx weather server and archiver. weewx will fetch samples from the Davis weather station, storing its summaries regularly (typically every 5 mins) in a MySQL or SQLite archive table . weewx can also can publish data to community Weather networks like Wunderground. 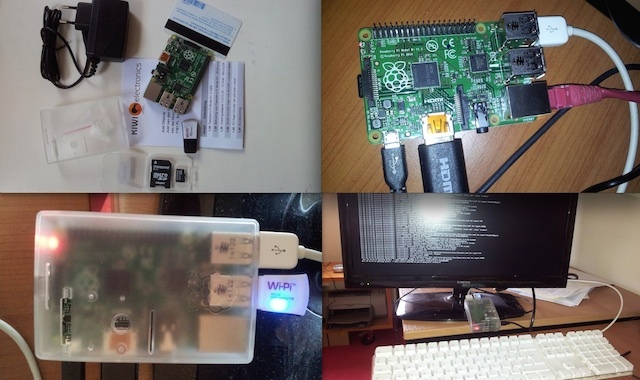 See the raspberrypi-install section for the full hardware setup and software installation of the RPi for the project. The choice is weewx with SQLite. weewx is installed as part of the raspberrypi-install. The weewx configuration for the Davis station is maintained in GitHub https://github.com/Geonovum/sospilot/tree/master/src/weewx/davis. After a first test using our WeatherStationAPI custom driver, the Geonovum Davis weather station will be connected. 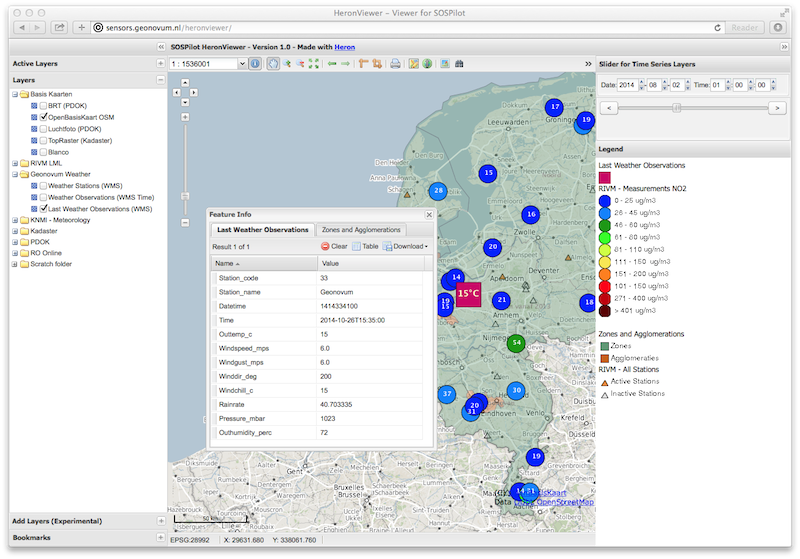 The web reporting is synced by weewx every 5 mins to to our main website (using rsync over SSH): http://sensors.geonovum.nl/weewx. This will take about 125kb each 5 mins. In addition weewx has been configured to report to the Weather Underground community site. 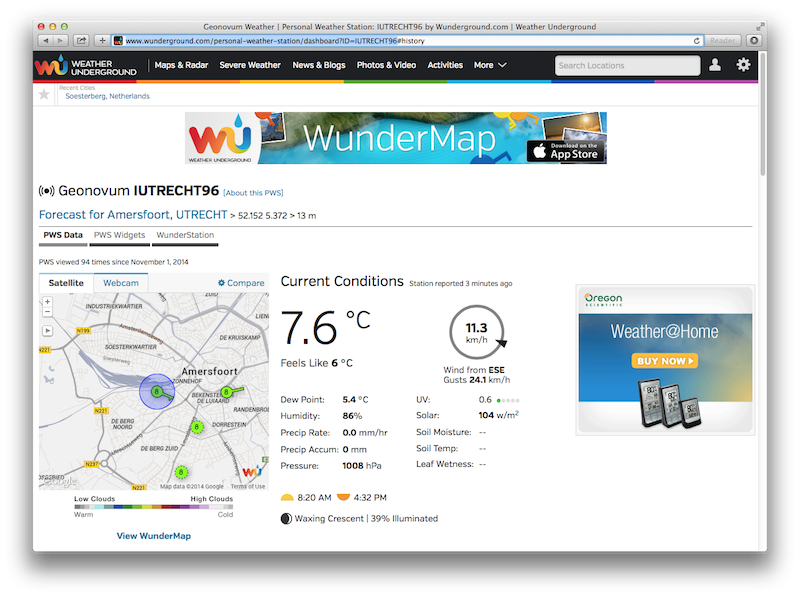 The station is registered as IUTRECHT96, http://www.wunderground.com/personal-weather-station/dashboard?ID=IUTRECHT96. Also, weewx has been configured (in sept 2015) to report to the MET UK Weather Observations Website (WOW). The station is registered with WOW site ID 929236001, http://wow.metoffice.gov.uk/sitehandlerservlet?requestedAction=READ&siteID=929236001. 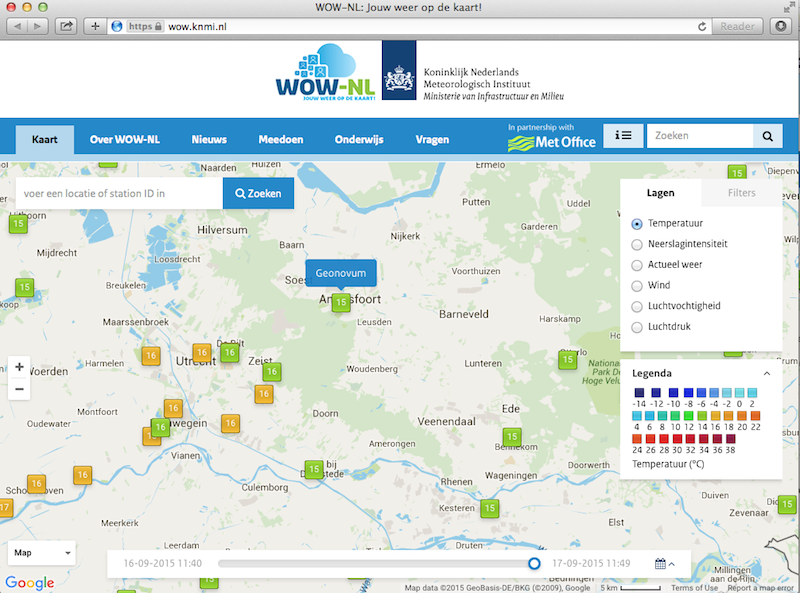 The Dutch KNMI has a localized version, called WOW-NL. The PostgreSQL database plays a central role. The 52North SOS will maintain its own tables. For the Stetl ETL and GeoServer datasources the following tables and VIEWs are created in the weather schema. -- all units in US metrics assumed! -- SELECT to_timestamp(datetime), "datetime","pressure","outtemp" FROM "weather". "measurements"
The raw weather data is stored in the measurements table (US units). In order to make the tables/VIEWs geospatially enabled, a stations table is added. The stations table is modeled after existing KNMI station data. Only a single station is added for now, the Geonovum Davis station. The measurements table has a station_code column to facilitate JOINs with the stations table. Via VIEWs more simple and geospatially-enabled data is created. Also the VIEWs take care of conversion from US to metric units. 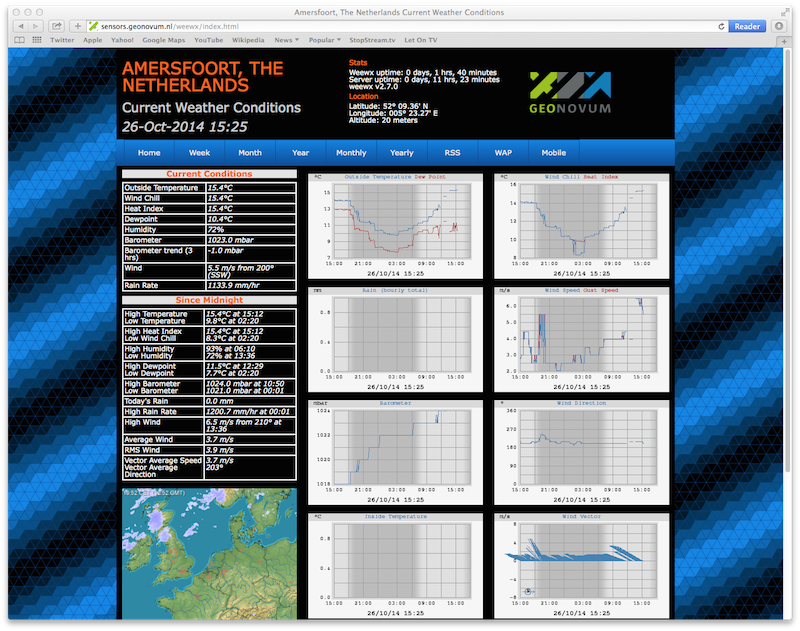 The weather.v_observations VIEW contains a selection of weather characteristics joined with station data. weather.v_last_observations contains the last (current) observations per station. Below an example of data in the view. This section describes the Stetl Sync processing within the RPi. Effectively this process will synchronize the latest data from the weewx database to a remote PostgreSQL database on the VPS. weewx stores ‘archive’ data within a SQLite DB file weewx.sdb . Statistical data is derived from this data. Within weewx.sdb there is a single table archive . The database/table structure (only relevant fields shown). Most of the Stetl Sync processing can be realizeed with standard Stetl components like for SQLite input and PostgreSQL publishing. Only synchronization tracking needs a small Stetl input component WeewxDBInput. This component keeps track of the last archive data record synced within a PostgreSQL record. At a later stage this may also become a Stetl component so the complete ETL could be effected in Stetl. The Stetl config is as follows. 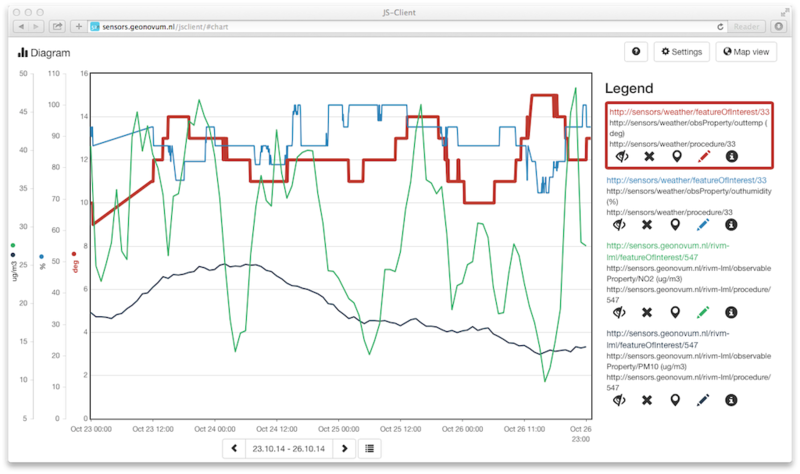 The target table is the PostgreSQL weather.measurements table depicted above. -- laatst verwerkte record id is van hun bron tabel. The Stetl Sync process is scheduled via cron to run typically every 4 minutes. The pi-etl.sh shell-script will first setup an SSH tunnel, then call the Stetl-wrapper weewx2pg.sh and then tear down the SSH-tunnel. The weewx2pg.sh script is as follows. $stetl_cmd -c weewx2pg.cfg -a "$options"
The options.sh script will set various (shell) variables to be substituted in the Stetl config. export options="host=localhost port=5432 weewx_db=$WEEWX_DB user=$PGUSER password=$PGPASSWORD database=sensors schema=weather table=measurements"
By calling the options-<hostname>.sh script, various host-specific/secured variables are set. These three layers were easily integrated in the SOSPilot Heron Viewer. This ETL process reads measurements from PostgreSQL and transforms/publishes these to the SOS via SOS-T. The design Similar to the RIVM LML AQ SOS publishing setup. As the weather data is published in the same SOS as the AQ data, both data types can be combined in any of the SOS browser clients. An example can be seen in Figure 8: both outside temperature (deg) and humidity (%) are combined with NO2 (Nitrogen Dioxide) and PM10 (Particulate Matter up to 10 micrometers in size). © Copyright 2014, Geonovum - CC BY-SA 3.0 - Just van den Broecke (author). Revision 7e2adf74.